This mystery writer is one of my very first followers. Her blog is so orderly and professional, I have to admit I was very intimidated at first. She founded the Writer’s Knowledge Database, the largest collection of writing information I have ever seen. I’m not sure how she finds and organizes it all, but I am impressed beyond words. She’s also a full time writer, something that is difficult to achieve. If you’re not following her Writer’s Digest 101 Best Websites for Writers, then you need to get with it! What strikes me first with Ciara is her optimistic attitude. It’s genuine and solid. Her feature “Did I Notice Your Book?” speaks volumes of her feelings towards her fellow authors. I imagine that after time in her presence, one would walk away feeling confident and ready to conquer the world. Ciara, sometimes we wonder if we are making any difference. Well, rest assured – you are making an amazing impact!! Laura Pauling signed a contract for How to Survive Ancient Spells and Crazy Kings. Congratulations, Laura!! Just to highlight another great A to Z theme – Jamie at Mithril Wisdom is highlighting metal and progressive rock bands with a fantasy/horror/science fiction edge. He's Welsh, so Jamie has only stumped me on a few of them. And just to clarify yesterday’s post – my wife is far hotter than Kate Beckinsale! Yes, I am damned proud of that fact. Are you following Elizabeth and Ciara? Watched Groundhog Day? Digging Jamie’s metal A to Z posts? Know what scene “Street Spirit” embodies? Do you have a scene in your book/manuscript that will forever eat at your heart? And who do you know that is orderly or optimistic? I don't know Elizabeth sonill have to check her out. I love Ciara & her blog! Thanks for all the referrals. I'm enjoying your friends! I can't type #*@$ on my phone! My wife is orderly and I am optimistic (or at least I tell myself). Nice clarification (recovery) with the Kate comment! Haha. Happy Tuesday! I haven't watched Groundhog Day in forever! It kinda scared me as a kid (big surprise, right?) cuz he kept killing himself over and over. I was like, um... what the crap??? I will definitely listen to that song sometime! Thanks for the great post! I thought only Radiohead did the best version until now, I was wrong, fecking great version, looking to download it now! Kate who? Mrs Cap'n Ninja is wonderful!! Yay!! Does your wife walk roud the house in a one-piece leather jumpsuit? I hope so. Loved the music, it certainly was wonderful to hear. Nancy, that's all right - I knew what you meant! Michael, I didn't want there to be any doubt. Lynda, no pun intended there, right? Lurker, didn't realize it wasn't their song. Thanks so much for this great mention, Alex! There are many days when I don't feel that organized, so you've made me feel better. :) Thanks. I loved Groundhog Day. Rita was *very* upbeat. Although less so when she smacked Bill Murray's character in the face all those times in a row. Which really made me laugh for some reason! I'll have to check out Elisabeth. I have followed Ciara for a long time and agree about her generous nature. Andie McDowell is lovely. I've seen her on interviews and she seems like a genuinely nice person. Ground Hog Day was just recently re-run on TV here! Always good to watch. I do visit Ciara and we keep in touch via email because her browser hates me. But, we have worked around it. I will have to visit Elisabeth. Alex, you are so sweet! You are a great inspiration to all fellow bloggers and authors. Thanks so much for the kind words. I just wish I could do more. Did I Notice Your book will return in May. Yay, I missed it. :) I hope you are enjoying the challenge. I know I am. Now I have to go and watch Groundhog Day again! Oh, yay! Massive congrats to Laura! And Ciara and Elizabeth are fab. That's a pretty awesome tune. I've not read the book yet,(takes me two weeks to read a book, so bad lol) is it a fight/battle scene? I follow Ciara and agree she's awesome! My mom is the most optimistic person I know. Love groundhog day. They should remake it, but I don't think they could outdo Bill Murray. I haven't watched Groundhog Day. I know it's crazy to think but it's true. And Jamie is always stumping me with his metal posts because I don't know any of those bands. Elizabeth, you're welcome! And those scenes made me laugh as well. Ciara, you are welcome! And you do plenty. Marta, Murray owns that role. MJ, I've know most of them. Crap, I'll fix that Jamie. Groundhog day is one of those rare films I've owned in many formats... from VHS to blue ray. I've got 'em all. Or, had them all at one time or another. And I did write a scene that tore me up once, I'm not sure anyone buy me has ever read it. But I got all bleary eyed and sniffly - It was so embarrassing. I didn't know about Elizabeth but I do now! Awesome! And I do follow Ciara. Thanks for introducing us to so many new things! Follow Ciara, will check out Elizabeth. Love 'Groundhog Day' except for the days I feel like I'm living it. Andie plays the same'upbeat' character in 'Michael'. I like her. Really like the song. I think I can guess the scene. Just can't get my head around 'Alex the head banger'. Ha. Heart eating scenes -- Oh yeah. I'm following both ladies, and Groundhog Day is awesome! One of those movies I can watch over and over and over again. Yes, I follow Ciara and Elizabeth. Your comments about those two lovely ladies are spot on, Captain. Groundhog Day is one of the best movies ever. If you love to laugh. And I do. Internet is buffering. But I'll listen to the song this morning. Rusty, need to let someone read it sometime. Heather, great Groundhog Day quote! Faraway, is the song not my style? Robyn, tonight I'll make sure she waves back. I'll have to check out the musical A to Z! I'm sure I'll find some new bands! I follow Ciara! She is awesome. Groundhog Day is one of my favorites. I always found Rita so charming, but her character is kind of a caricature. She was a great foil for Phil Conners, though. That song is incredible, and I know exactly what scene you're talking about. The saddness, trauma, the loss, and anger...it's all there. Aw, so sweet! And your picks for orderly and optimistic are spot on. Thanks for sharing, off to visit. Rita in Groundhog day was one of my favorite things as a kid. I've seen the movie several times and read the screenplay several times. Every screenwriting class ever makes you read it because it's so well structured. Groundhog day is still one of my favs. Groundhog day is one of my favorite movies. I hope my day today isn't a repeat of yesterday. From what I know about you - and how awesomely nice you are, I'm sure your wife is not only hot, but I'm sure she's crazy about you. What a nice thing you said about her today. Thanks for introducing us to so many great blogs! Already follow Ciara, but thanks for introducing us to Elizabeth! Always love following new fellow mystery writers! And congratulations Laura on your new contract! Elizabeth is one of the first bloggers I met - we took a blogging class together. I love her and her blog. Thanks for giving her a shout out. Jay, you do know the scene. Ella, nose yoga just sounds painful. Libby, that would be an interesting class to take. Teresa, she's those things as well! Clarissa, I hope she is! Karen, that's how I met her as well. I know Ciara Knight, but not Elizabeth Spann Craig. That Writer’s Knowledge Database sounds amazing. Need to check that out! Ciara is such an amazing and talented author. Wow, awesome song. Touches your soul. Off to check out Elizabeth and Ciara. Thanks again and have a great day! Thanks Alex, Some wonderful mentions you've made here! You know all your blogger friends so well! It's amazing how you can remember who to pick for what. Elizabeth is amazing -- I don't know how she manages her social media accomplishments, a family, and two mystery series. Just thinking about her schedule makes me want to take a nap. Ground Hog's Day was one wonderful circle tour! Glad you clarified that little bit about your wife and Kate Beckinsale and gave us more blog recommendations. So many!!!! I've known Elizabeth for years and recently got to meet her in person. She is just a delight! I'm already following Ciara, she's awesome. Great character pick. I can't think of anyone more optimistic! I love the optimism, something that tends to lose with age. I tend to be a bright side type person but closer to the realist spectrum. Ciara is wonderful. Many congrats to Laura! My glass is half-full. But I can get misanthropic and be a bit like Eeyore. Tracy Jo, yes it does. Matthew, I started making a list early. Patricia, I'm ready for a nap as well. Just watched Groundhog Day for the fiftieth or so time this past weekend. She is "upbeat" for sure. Groundhog Day is, and will forever be, a classic. Loving this challenge :) I'm having a great time and enjoying reading everyone's posts. Jaycee, it's such an easy movie to get sucked into. Michael, I'm sure even she would say I was the luckier of the two. But I do try. Jamie, glad you're having fun! 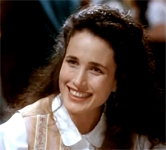 I actually was at an art fair in Asheville when Andie McDowell (Rose Crauley or Crowley to the natives) showed up. She's very tall and just as gorgeous in person. A big presence. Every Groundhog Day I watch the movie, and every Groundhog Day I say to my family, "Gosh, you’re upbeat." True story! I love Mystery Writing is murder and I admit I was intimidated by her blog at first. It is full of so much information I can linger there for hours. I met Ciara on Day One of the challenge as her blog is a couple of stops after mine on the list. Off to check out Elizabeth's blog. I need to learn from orderly people! Thanks for pointing me to Jamie's blog, I am now following. Welsh and prog/metal - good combo. I am orderly, actually I am probably OCD. That would have been an interesting O. Visiting as part of the A-Z challenge. Love your blog, cool post! I'm not familiar with Elizabeth's blog, that's definitely one I need to check out and follow. Love Groundhog Day, I hadn't thought of that movie in ages. The music's beautifully moving, Alex. I appreciate the depth of that scene even more, having listened to it. Thanks for sharing. I can hear Bill Murry uttering those words. Great snippet! It makes me laugh. Bill Murray's line cracks me up. Caddy Shack is hub's all-time fav. And, thanks, Alex, for the support! I love Groundhog Day and her character. Robin Weeks also did a post on optimism. Just what I needed today. I follow both Elizabeth and Ciara. Congrats to Laura!! I love Groundhog Day! Such a good movie. Will have to watch it again, I think I saw it on my OnDemand. Melissa, Elizabeth is just super nice. Alexandra, you won't regret following him. I've followed Ciara for several months and must agree regarding her upbeat spirit. I'm going to check out Elizabeth's blog. Three cheers to Laura for that contract. Way to go! I'm really enjoying all the music over at Jamie's blog. I know a few writer friends who are really organized. Ciara really is fantastic, indefatigable, so very talented and so very genuinely kind. And I love Groundhog Day. I love Elizabeth's Writers Knowledge Base. Like you, I don't know where she finds all the 'knowledge' to impart but it is a fantastic resource for authors. Denise, I just don't know when she has the time, but she's always finding good stuff! I thought Groundhog's Day had an interesting premise, but that it dragged a little too much. Those are two great blogs! And I have really been enjoying Jamie's posts, even though metal is not something I usually listen to. Haven't seen Groundhog Day in a long time. I own Groundhog Day; that's how much I love that movie. And Bill Murray is perfect. Time to watch Groundhog Day!! I'll have to check out Ciara. As well as a second helping of Ned! Ned Ryerson! Elizabeth was one of my very first blogging buddies, err ... budettes. And Ciara has an amazing blog. Both have hosted me on blog tours. Awesome ladies! And Groundhog day is a classic! Think I'll put that in my Netflix qeue. I'm a Ciara fan already, but have not seen Elizabeth's yet. Heading there now. Thanks. 'Groundhog Day' is a great film. Well, at the very least, funny and fun to watch. MsHatch, we own it as well! I am not following those two ladies, but I will check them out! Another great set of blogs. Rita was a great character. Very loveable. I loved Groundhog Day and its characters. Tenacious is the perfect writerly word!